Gnocchi brown buttered in vegan butter and fresh rosemary. 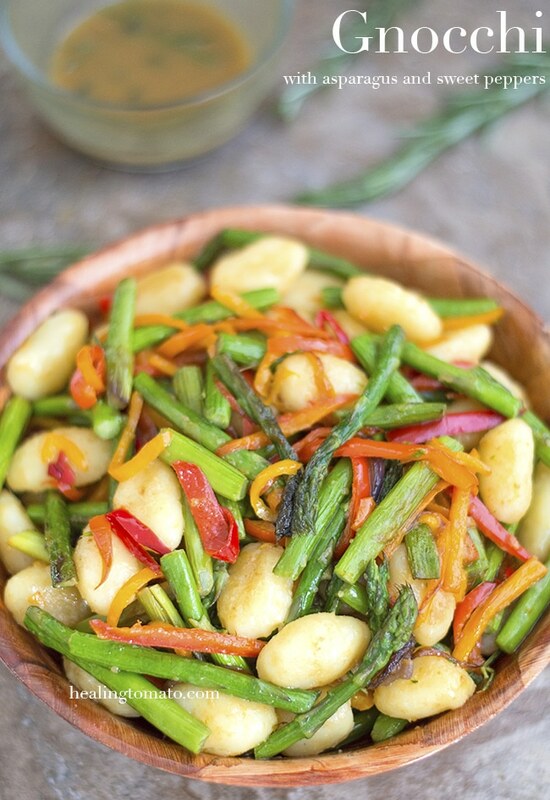 Add roasted asparagus + sweet red peppers. Mix with a dirty vinaigrette. It is the best 30 minute vegan meal ever! I am a huge fan of this Italian favorite and it has a very special place in my heart. It was my first meal I ate at the first Italian Restaurant I could afford after moving to NYC. Until that day, I had never heard of it and I didn’t even know how to pronounce it. I remember telling the manager that I would like to order, “ga-no-chee with pesto” . He smiled and told me that it was pronounced, “nyo-ki”. I told him that I am new to NYC and I have never been to a fancy Italian restaurant. He laughed and said that he wished me luck in the “big city”. I gave him a good tip not only because he was nice to me, but, because the Gnocchi was absolutely delicious. I had no idea that it was made with potatoes. Over the years, I have made my own gnocchi whenever time permitted. There is nothing quite like fresh gnocchi, but, if you don’t have the time, store bought works just as great. Most store-bought gnocchi is vegan, so, you can easily use it in vegan recipes. But, I always check the ingredients to be sure. Also, I don’t go for the frozen gnocchi. The dry gnocchi that is vacuum packed is always fresh tasting. This vegan recipe can be a great dinner recipe or you can eat it as a side meal. 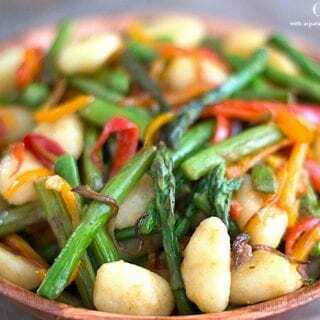 I put asparagus and mini sweet peppers with the gnocchi, instead of making it a traditional sauce recipe. To add flavor to the gnocchi, I brown-buttered them in vegan butter, then added them to the roasted veggies. Finally, I topped it with my dirty vinaigrette which takes only 5minutes to make. 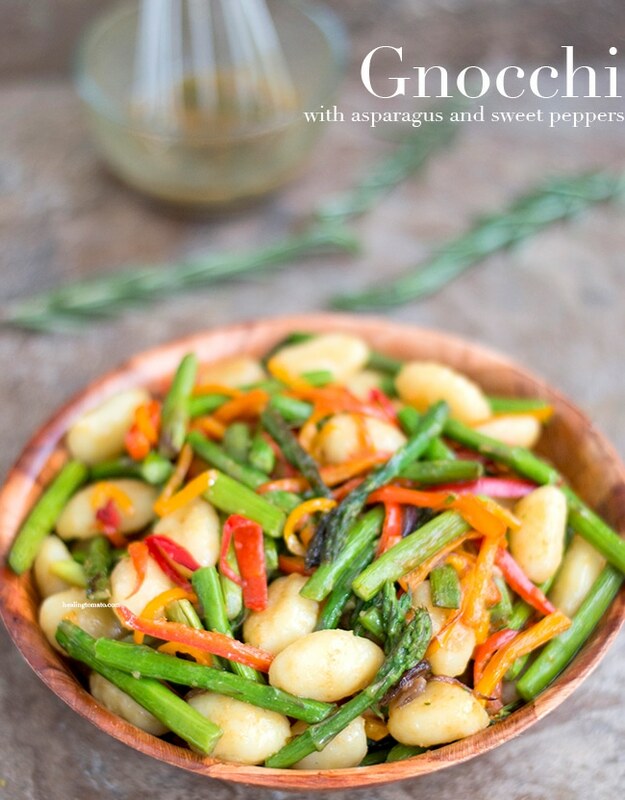 So, next time you are looking for a quick dinner or side meal, this vegan gnocchi will take only 30 minutes to make and it is so delicious. I dare anyone to hate asparagus after they have tried this delicious recipe. Gnocchi is not just for Italian recipes. 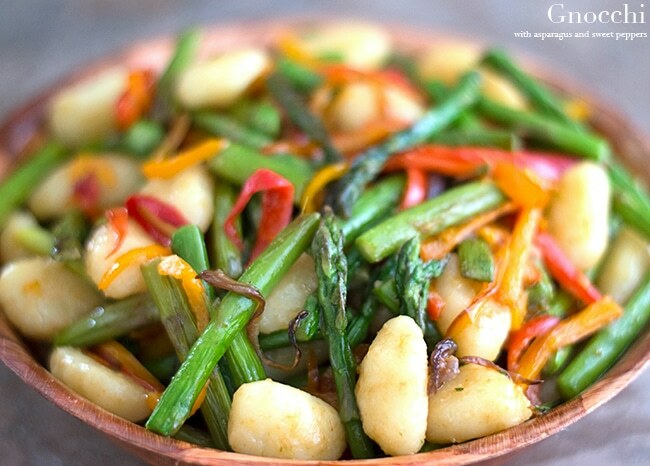 One of my favorite dinner recipes is my Vegan Mexican Flavored Gnocchi Recipe made in one pan. The key to this recipe is rosemary because it adds flavor and aroma to every ingredient! It makes all the ingredients more flavorful because I put rosemary right when I added the butter. Can you imagine the aromatic heaven that was my kitchen when I was making this dish? Make it for yourself and see what I am talking about. Everything about this recipe is heavenly. 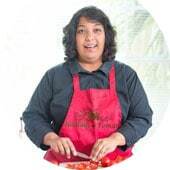 I served it to friends who weren’t vegetarian and they loved it! They couldn’t believe that a recipe can taste this good with no meat in it! Getting them to admit that much was a huge victory for me! Maybe there is hope to convert them into part time vegans? I will settle for that! So, what is your favorite way to make gnocchi? Gnocchi brown buttered in vegan butter + fresh rosemary. Mix with a dirty vinaigrette. Best 30 minute meal ever! Whisk everything together until it is well blended. In a heavy bottom pan, add butter and rosemary. Add the cooked gnocchi and mix well. Keep mixing to prevent them from sticking. Wow love how flavorful this gnocchi pasta recipe is! 30-minute meals are the best! Love the veggies in there. I love this! Ive always been wary of store bought gnocchi…. but now Im going to try it out! Pinned ! Ok, first that dirty vinaigrette sounds divine. Then the roasted veggies and gnocchi sound amazing too. What a killer meal. We love gnocchi around here. 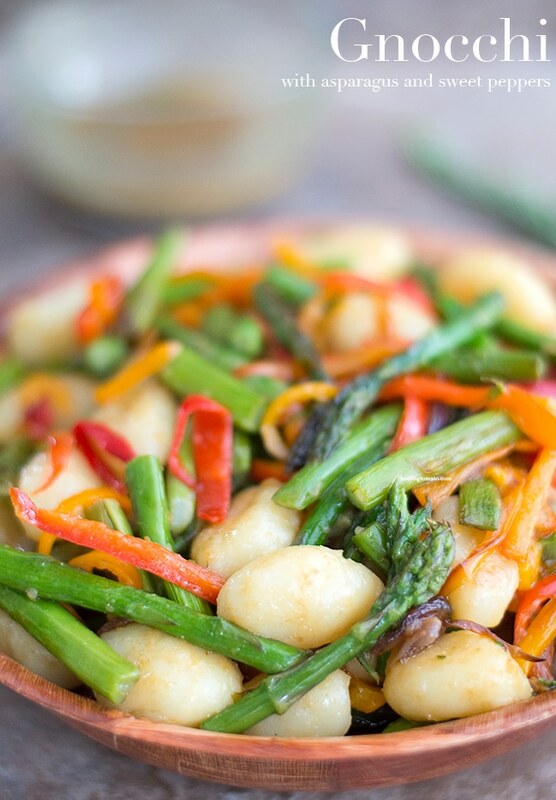 Your asparagus and sweet peppers look so perfect in this recipe. This looks and sounds delicious! I like mixing veggies like this, it always comes up with a great dish! This is probably the saddest thing ever, but I’ve never had gnocchi. I think it looks and sounds delicious, but I haven’t actually tried it. I need to change that. I would have definitely gone for frozen not dried (since that usually is the way to get fresh), so I’m really glad I read your advice to go the other way around! Thank you, Jamie. It is never too late to start eating gnocchi. Once you go gnocchi, you don’t go back, lol. I’ve never had Gnocchi before! Looks like its time to try! Oh my goodness sakes! This sounds and looks so so so delicious!! !